2013 Bowman Draft Picks & Prospects Baseball sticks with the proven focus that's right there in its name. Largely ignoring anyone born before The Fresh Prince of Bel Air debuted on TV, the release delves deep into the year's rookie crop, upcoming prospects and key 2013 draft picks. Part of the formula that returns is the mix of base Bowman and Bowman Chrome cards. Bowman cards include 45 rookie base cards, 130 draft picks and another 45 prospects. All draft picks are from 2013. Bowman parallels include Blue (#/500), Orange (#/250), Red (#/5), Printing Plates and Black (1/1). There are five total Bowman cards in every pack. Bowman Chrome cards fall two per pack. They have the same rookie, prospect and draft pick configuration as the base Bowman cards. The always-popular Refractor Rainbow returns with even more colors. Besides basic Refractors, there are Blue (#/99), Green (#/75), Gold (#/50), Black (#/35), Orange (#/25), Red (#/5), Printing Plates and Superfractors (1/1). Silver Ice parallels are inserted one per box. Rarer versions include Red Ice (#/25), Purple Ice (#/10) and Black Ice (1/1). Collectors can also find random Blue Wave Refractor packs. Bowman Chrome Prospect Autographs are the big box hit. Focusing largely on 2013 draft picks, over the long-term, these will likely be some of the top cards of the featured players. Bowman Chrome Autographs follow the same Refractor pattern as basic Chrome cards. These aren't the only place to find signatures. New to 2013 Bowman Draft Picks & Prospects are Draft Day Autographs. Numbered to 10, these cards use photos taken on the same day they were picked. Cards are print on Chrome card stock. The Bowman Black program continues with another 25 cards, all numbered to 25. Numbered AFLAC, Perfect Game and Under Armour Autographs return, showcasing emerging stars from past high school All-Star games. The only memorabilia cards in 2013 Bowman Draft Picks & Prospects Baseball are the All-Star Futures Game Relics. Numbered to 99, the cards have pieces of jerseys used at the summer showcase. New parallel versions include Purple (#/10) and Black (1/1). Dual Draftees is an insert set that has two 2013 draft picks that are now part of the same franchise. Autographed versions are numbered to 25 with a pair of parallels that are even tougher. Die-Cut inserts center on key prospects. In true Chrome fashion, they follow the Refractor rainbow with several parallels: Refractor, X-Fractor (#/99), Autograph, Superfractor (1/1) and Atomic Refractor Autograph (1/1). Carrying on from other 2013 Bowman products are Blue Sapphire reprints of some of the most popular Bowman cards of all-time. 2013 Bowman Draft Picks & Prospects Baseball has a pair of prize redemptions. The first is for player-worn draft day memorabilia. These include hats, shirts and other equipment from the MLB Draft Studio. The MLB Draft Ticket will award a pair of tickets to the 2014 MLB Draft. 2013 Bowman Draft Refractor Dominic Smith+ blue wave Lot! Non auto! Sweet Cards! *Pack odds for Hobby (H) and Jumbo (J) packs are noted below, when known. 47 cards. Click here for a detailed guide and gallery. Good: Nice variety of rookies and prospects including Yasiel Puig, Clint Frazier, and Austin Meadows. Bowman Ice parallels. On-card autographs. Bad: Only one hit per box. Most cards are of players many have never heard of yet. Most prospect cards take time to develop and gain value. The Bottom Line: 2013 Bowman Draft Picks & Prospects Baseball is a great product for rookie collectors and prospectors. While it is very affordable, there is a chance to pull some great autographs, even if they're from players you may not have heard much about yet. Like most of the Bowman products, if you are willing to wait until the prospect develops into a MLB-ready talent, you could be holding onto the next hot card. The base card design is similar to past Bowman designs that collectors are accustomed to. Clear photography is surrounded by white borders. Similar to past releases, you get two sets in one product with Bowman and Bowman Chrome cards in each pack. Parallel cards return in color, Refractor, and Ice forms. The Ice cards look particularly amazing. There are several insert cards in this product: Bowman's Best All-Time Players, Breakouts, Dual Draftees, and Future of the Franchise. Bowman's Best All-Time Players is basically a rookie reprint card in a blue Refractor tint. I always liked pulling a reprint card of a rookie from the same product from years past. Adding the new blue Refractor tint around it is a nice touch. Breakouts is basically the base card with a black background, which seems kind of dull and boring. The die-cut Refractor version, however, looks a lot better than its base insert counterpart. The Dual Draftees look very colorful showcasing a brown brick backdrop with a green grass colored scoreboard alongside both players positioned next to each other. Future of the Franchise is a mini chrome insert. I personally dont like mini cards as it is hard to put in sleeves and seems out of place with the other cards in the box. Autographs on-card, which is always preferrable. The base set is comprised of 220 cards which include 45 rookies, 130 draft picks, and 45 prospects. This product is loaded with tons of the top young players in the game today. Major rookies like Yasiel Puig, Dylan Bundy, Wil Myers, Manny Machado, Jose Fernandez, and Jurickson Profar are all present. Puig also has an autograph, albeit a redemption. Clint Frazier and Austin Meadows are included. Overall, the checklist has a solid amount of rookies and top prospects with huge potential that will, hopefully, become superstars one day. 2013 Bowman Draft Picks & Prospects is an affordable low-end product that gives you one hit per box. It will take a few boxes to try complete the set since you only get two Bowman Chrome cards per pack. Most of the stuff you pull from this product may not gain any substantial value until several years down the line when that prospect approaches their big league debut. As always, you have to take a wait-and-see approach with the product. This product is ideal for rookie and prospect collectors. There are no veterans or Hall of Famers in this product outside of a couple of inserts. Some collectors like a mixture of each. Some prefer products like this that cater to their needs. The inclusion of Bowman Chrome cards and Ice parallels offer enough, even after the autograph is pulled. 2013 Bowman Draft HOBBY Pack (Clint Frazier Black Gold Chrome Refractor Auto)? 2x 2013 Bowman Draft HOBBY Pack(Clint Frazier Black Gold Chrome Refractor Auto)? 2013 BOWMAN CHROME DRAFT CLINT FRAZIER REFRACTOR AUTO RC! Each includes at least one autograph. Here are the top 5 deals on 2013 Bowman Draft Baseball jumbo boxes currently listed on eBay. Each includes a total of three autographs. I have to give this product 1 star, because the average fan will not be able to access this via the traditional retail route (Walmart/Target). I refuse to pay $expesive$ Hobby pricess and deal w/ shaddy businesses where their boxes are pack searched by the owners. If I want to purchases a $6 rack pack or $20 blaster box I no longer have that option. 2011 Bowmand Draft Picks & Prospects was my favorite product to date…to bad it will be the last product line I will purchase until Topps changes their policy. Dan � Sounds like you’ve had a poor experience at a hobby shop at some point. There are plenty of trustworthy dealers out there though, especially when you factor in online sellers. Packs may be trickier to find online, but box pricing can be very competitive, which is a good thing for buyers. tom � Those would likely be 2013 Bowman and not Bowman Draft as they’re not due out until much later this year and are hobby-only. Good luck with your breaks. I give it a 1 star as well I went to target today to pick up some and they had 2 boxes left the only thing was that BOTH boxes were COMPLETELY empty what a damn shame! And they didn’t have any gypsy queen except for blisters and then sometimes I buy those cheap packs for $3.99 well I got my $$$’s worth with a LEBRON JAMES rookie card! Also a nice lookin late 90’s Fleer MJ card as well as a Scottie popped rookie thanks target for the mini green gypsy queen and the other box had a black framed relic card but yea all the new 2013 stuff was GONE !! Markdaniels � Perhaps it was regular Bowman you were looking for because this set isn’t out for several months. And one star because there weren’t any? Also I’ve been collecting 30 yrs I cannot believe ppl spend the time to sit there and pack search or check for thicker packs however the hell they do it and get away with it I think they SHOULD lock up the more expensive stuff but target makes absolutely well I mean they DON’T LOSE any $$ with that type of product the marketing cpany does and why the hell should they care if they’re making a small percentage compared to the other things they sell in they’re store! Cards aren’t or WON’T ever be policed! Not at target ATLEAST and my local HOBBY store bans u from the shop if they see ANYONE pack searching! Also target is called RETAIL so when it had to do with a large chain such as target where you don’t have to even have a GED to work there let alone papers saying that you were born in the USA I see it as a monopoly like Nike but Nike is STILL popular after all these years ! I really like this product alot!!! I’m a girl and I love collecting baseball cards!!! I love bowman draft picks because it gives me the chance to get autographs from the players personally. Especially when me and my family travel to Arizona so we can go to the Fall League!!! The only thing that bothers me is that there’s only one auto per box. I wish there could be an added relic card at least. $60 for a HOBBY BOX is not expensive, you spend $20 on a blaster box, only difference is you CAN NOT pack search ! Better odds & guaranteed auto ! Dacardworld & Sbay are trusted. I to like to buy retail rack packs especially when I no theirs a hit in it !! But I will buy a box or 2 because its worth it !! Quick question, so the 3 rookie autos you get per jumbo box are the ones you would get in regular bowman and bowman chrome? Ex. Same card style and numver for the buxton or Correa? Can you get the Puig? Im new to collecting cards and this is very confusing to me. 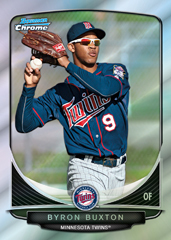 I was interested in bowman chrome but found out correa and buxton were only in regular bowman but they came out as bowman chrome. This is very deciptive to new hobbyist I think. So can you please explain a little more in detail the cards in the bowman draft and prospects vs the other bowmans. Im.interested in jumbo hobby only. Johnny � Bowman, Bowman Chrome and Bowman Draft all have similar designs but are different releases, each with their own checklist. Jumbo boxes for all three have three autographs, though they’re mostly the same as those found in hobby boxes. Purple Refractors are only in jumbo boxes. Thanks Ryan, do you have the checklist with names and card numbers? Does the draft and prospect set have as much value as the regular chrome and bowman sets do? The full checklist isn’t out yet. Values will depend on whether they’ve had a Chrome-themed autograph in the past. Bowman released the checklist on fb. No Kris Bryant makes this set a no go for me. 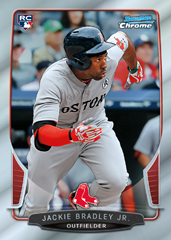 Jon � Perhaps to save something for 2014 Bowman? Probably. But I figured they would ride Puig out even until then. I mean Dylan Bundy has been beat to death in Bowman. Panini has a fair amount of Bryant autos though so that is a plus. I am an avid fan of the Futures Game relics and this is the most disapointing checklist in years. No Buxton, Sano, Bradley, Correa, Polanco or Pederson? What are they thinking? Kris Bryant has autos in this product, so does Puig. And no retail just means the value will be better, retail waters down the product. Boxes are cheap enough as it is, and if you know this product, it’s always a 5 Star winner! no kris brant base auto? really? Will these cards have the Bowman 1st stamp on them? Kelly15 � Not sure. The stamp will be back for 2014 Bowman, though. is this a hobby only product? did bowman ever say why they changed it to a hobby only product? Because I hate it, since I cannot afford a hobby box. Isaac � It went hobby-only last year for Draft because they weren’t moving enough at retail to make it worthwhile. sorry, last question is there any jumbo boxes this year? Yes – 3 autographs per box. They seem to be hovering around $125. bowman draft used to be my favorite product period. I feel it lost a lot of luster once topps lost the license to USA players that used to be in draft. Additionally, they even have second rounders for autos. seems to me that it just used to be better or perhaps I just got spoiled. Had a great time opening my box. Pulled a Riley Unroe auto and a Aaron Sanchez red /5. My only complaint was that the blue paper parallels both had serious printing marks. Got my hobby box in the mail today. Pulled a Clint Frazier autographed Chrome. Got a Puig Chrome refractor. Reese McGuire 87/250, Ryan McMahon 17/25, Will Morris 56/99, and a Strasburg 1st Bowman Card. Very pleased. I started collecting baseball cards again a little over 1 1/2 yrs ago. Like most collectors I had my fair share of big hits and duds. I find a local hobby store 15mins. away from me. I would purchase a hobby box or a hobby jumbo box every two weeks. 95% of the time I would open up the packs at the store. With my experience with this hobby store they are very loyal to customers who return to their store. I was going thru a dud drought on the cards. Hit that stage where I would keep getting the same auto card. One day there was a little kid and his sister in the store with their dad. I bought a jumbo hobby box of Bowman. The auto cards i pulled I already had. So i decided to give the auto cards to the boy and his sister. I returned to the hobby shop two weeks later bought another box of 2013 Bowman. Didn’t get much out of that box either. However, right before I left the owner tells me she has something to give me. She said because what I did two weeks ago and that i’m a loyal customer. She handed me a 2012 Topps Gypsy Queen Bryce Harper RC. I was completely shocked. I since moved and now the Hobby shop is over 1 1/2 hrs. away from me. I still make the drive there but only once a month. I will have to agree it does seem Topps has put more duds in the product. If your someone who’s looking for the big ticket item. You should save your money and just by the card off ebay. Specially, if you only collect certain players. If your like me. You like the thrill of opening up a box and being the lucky one to get that super rare auto card. So that brings me to my one and only complaint with Topps. The redemption cards. I have 7 redemption cards that are over a year old and have not been sent to me yet. There two cards that I have no problem with Topps sending me two replacement cards. However, the rest I do. Mainly because their rookie auto short prints. If you are looking for that Yasiel Puig auto card. I will tell you this I bought a redemption 2013 Bowman Platinum Soler/Puig dual auto off of ebay. I redeemed the redemption and the card was sent to me in less than two weeks. When it comes to the extremely High end cards like Tribute and Five Star. It might be best buy the autos that you want off of ebay. You get the card you want and you don’t have to pay an arm and leg for the product. Specially if your on a card budget like me. I have been reading the reviews of this product and have to agree with what seems to be the general consensus that this year’s Bowman Draft is mediocre at best. It seems to me that instead of focusing on the Draft players, Bowman (and Topps) has decided to get behind the flavor-of-the-month and force it down everyone’s throat. I am not saying the Puigs, Buxtons, Bogarts, etc. aren’t worthy of their due, but consider…this set is the Bowman Draft Picks and Prospects yet the overall #1 pick (Mark Appel) is ONLY available as an insert. Anybody following college baseball in this country knows about Mark Appel. Perhaps Bowman can explain why he is denied a card of his own in this set. Just my thoughts…you don’t leave a number one overall pick out of a draft set. I prefer mid-end cards. So this might be a little low end. Are there any Buxton/Sano Autos in this ?? I don’t see there being any. Bowman Platinum is the only Buxton Auto in the Bowman series? does every hobby box (24pks, 7cds) come with a blue wave refractor pack? Isaac � I don’t think so. Isacc – From what I have seen, out of every case of 12 hobby, there seems to be slightly less than 2 blue wave packs and slightly less than 1 black wave pack, so expect one of the 2 in every 4/5 boxes, I’ve only seen around 5 cases so I could be wrong but not every box for sure. First of all this product is amazing. I was surprised how much money you get back from opening a single box! 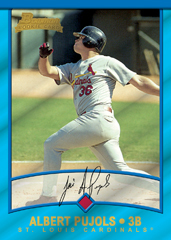 But I wanted to know is there a Blue Sapphire Best Bowman Players of All-Time Auto? I think this is a great product. Thats not because i got a blue wave and a black wave pack in my box. I just like how you seem to have a good chance at making your money back. Aaron Blair black wave auto. I’ve noticed the one’s on ebay also have a smudge right below the auto. I pulled the Byron Buxton Black Ice 1/1. Gotta be happy with that!!! I love the product. 4 stars because I got a mini refractor that was way off centered. Other than that, I love it. One question though.. Is there an Orange Ice refractor #/5 in this product? Someone has one listed on eBay and I need answers.. Thanks!